For the ricotta: Combine the milk and 1 teaspoon salt in a medium saucepan. Heat until the milk just begins to simmer (don’t let it boil). Remove from the heat and stir in the lemon juice just until the milk separates and curds begin to form, 30 seconds to 1 minute. Remove from the heat and let sit until the curds separate from the whey and there are white clumps of ricotta with watery whey remaining, about 10 minutes. Meanwhile, line a strainer with a double thickness of damp cheesecloth. Set the strainer over a large bowl. Lift as many curds as possible from the whey with a large spoon and transfer to the strainer. Gently pour the rest of the mixture through, to catch all of the curds in the cheesecloth. Pour out the whey from the bowl, then return the strainer to the bowl and let the ricotta continue to strain until it is thick and creamy, 10 to 15 minutes. For the salsa verde: Combine the parsley, capers, mustard, anchovies, scallions and garlic in a blender and pulse until coarsely chopped. Add the olive oil and 3 tablespoons water and puree to make a sauce smooth enough to drizzle from a spoon. Season with salt and pepper. 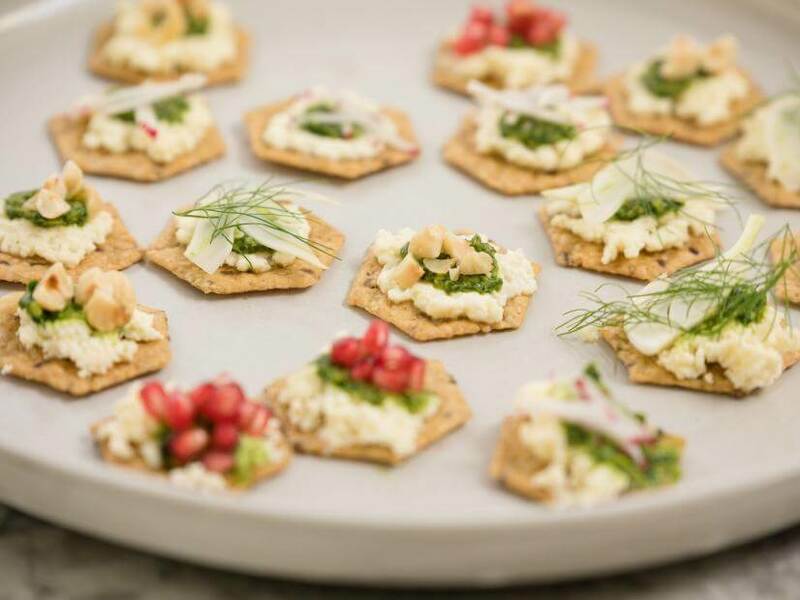 Spread the ricotta on the Crunchmaster® Rosemary & Olive Oil Multi-Seed Crackers and top each with a dollop of salsa verde. Top with the garnishes of your choice, such as thinly sliced fennel, thinly sliced radish, pomegranate seeds and chopped toasted hazelnuts.